When you brush and floss your teeth every day, chances are that you’re not thinking about how healthy your heart is. 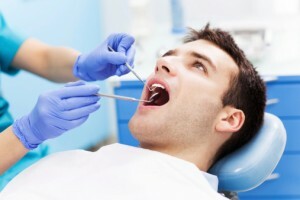 Research has shown, however, that there is a very important connection between oral health and overall wellness. At Dental Expressions in Oklahoma City, OK, Dr. Colin Holman and Dr. Natalie Frazier offer an all-encompassing range of general and preventive dentistry services, including gum disease therapy, to keep your smile and your heart healthy. Most of us know that gum disease can lead to bad breath, bleeding after brushing, and even tooth loss. The affect that periodontal infections have on the rest of the body, however, are not as well known. When the bacteria that cause periodontal disease make their way into the blood stream, they are free to wreak havoc on myriad other tissues and organs, including those that comprise the cardiovascular system. Patients with untreated periodontal disease are considerably more likely to suffer from high blood pressure, coronary artery disease, and heart attack. In addition to heart health concerns, gum disease has been linked to cancers of the blood and pancreas, liver problems, osteoporosis, and rheumatoid arthritis. Fortunately, periodontal therapy at Dental Expressions effectively manages gum disease in a way that reduces your risk of developing these and other health complications. If you notice bleeding while brushing, chronic bad breath, swollen gums, or any other abnormalities, we recommend scheduling an exam as soon as possible. When treated in its earliest stages, gum disease is relatively easy to manage with more frequent cleanings. At Dental Expressions, we care about not only the health of your smile but about your overall well-being, too. Contact us today to learn more about gum disease therapy and to schedule your next exam. We genuinely look forward to serving your complete oral healthcare needs. Our state-of-the-art dental practice in Oklahoma City, OK proudly serves families from throughout nearby communities in Moore, Midwest City, Norman, and beyond.